You'll find a unique collection of apparel & gear that best helps you prepare for your vacation adventure. 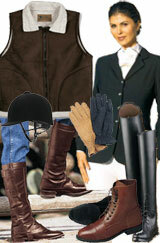 This store offers some of the best deals on equestrian riding apparel, horse tack and more. here you will find anything you may need for your riding vacation with Hidden Trails - from chaps and footwear to breeches, gloves and helmets. -- for hiking, biking, kayaking trips, etc. A fun, easy to use, 'one stop shop' where you can 'get ready to go', we have configured the TRAIL PROVISIONS & GEAR STORE based on the needs of HIDDEN TRAILS travelers. The items in the store are sun protective, lightweight, easy packing, waterproof, windproof, moisture wicking, quick drying – all as you need them to be. Operated by our marketing partner, New Headings, the TRAIL PROVISIONS & GEAR carries hand-selected gear & apparel from Patagonia, Tilley Endurables, Eagle Creek, TEVA, Smith Optics, and other fine brands. 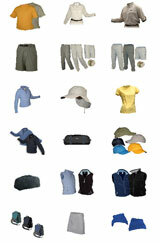 Best of all, you may elect to have a number of the apparel items you purchase embroidered with the HIDDEN TRAILS logo.